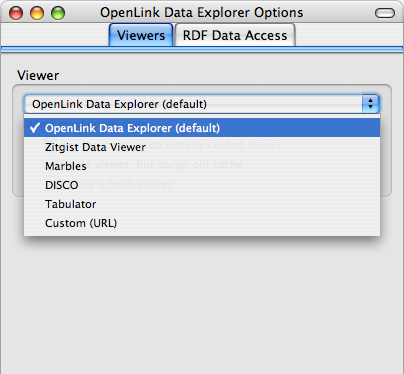 What is the OpenLink Data Explorer Extension? 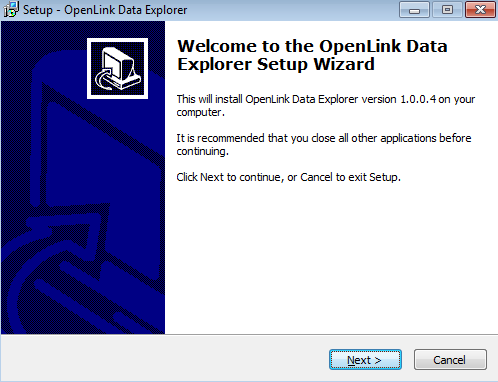 Why is the OpenLink Data Explorer Extension Important? How Does Linked Data Work? 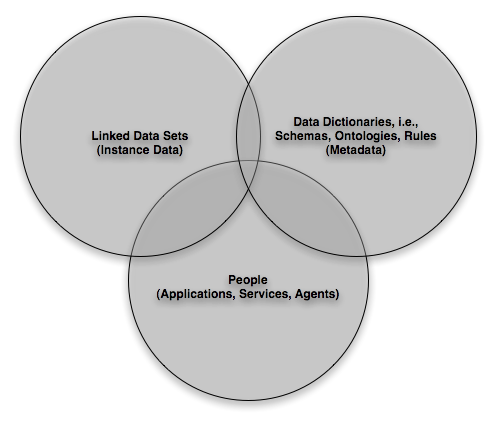 What is the Linked Data Web? 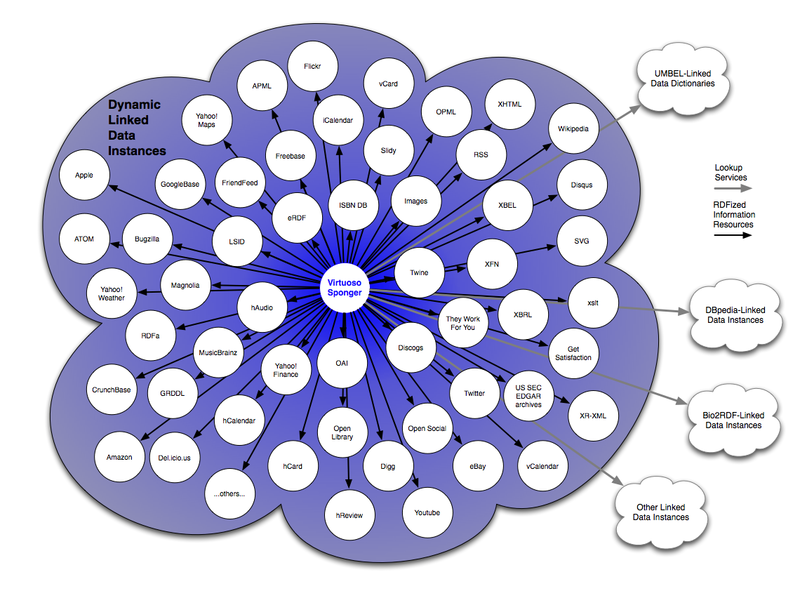 What is the Linked Data Cloud? Why is the Linked Data Web Important? 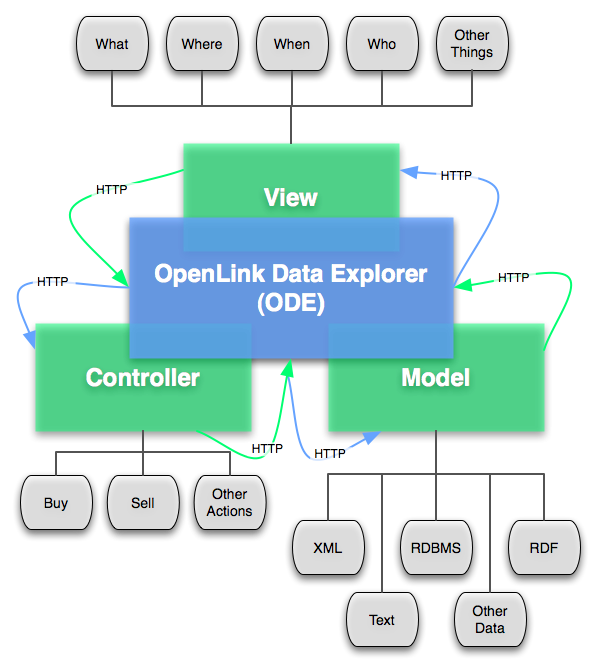 How can the OpenLink Data Explorer Extension help me exploit the Linked Data Web? The OpenLink Data Explorer (ODE) is a browser extension (currently available for Firefox, Safari, Chrome, Opera, and Internet Explorer with additional browser support to follow) that adds a new option to the realm of Web User Agent functionality, in the form of new menu options for viewing Data Sources associated with Web Pages. ODE allows Web users to explore the raw data and entity relationships that underly the Web resources it processes. The extension enables users to switch between Hypertext and Hyperdata link traversal of Web data. ODE uses a modular architecture to orchestrate component activities according to the M-V-C pattern. Orchestrated components, referred to as "Cartridges," deliver functionality comprising data extraction and modelling (Model), data display and presentation (View), and actions based upon and/or guided by that data (Controller). Each component is independent of the others, and all are coupled with ODE via HTTP messaging. 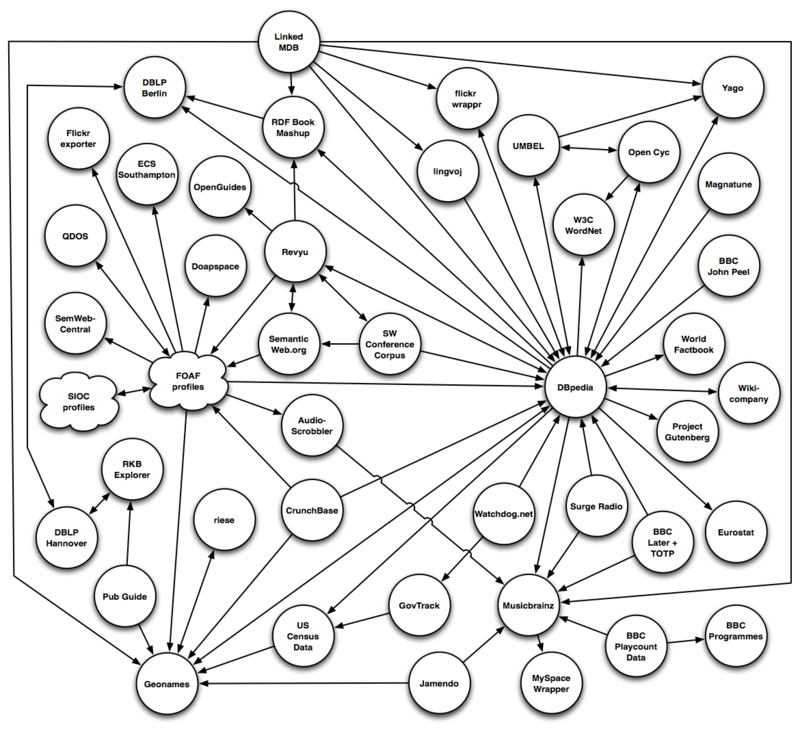 The term "Linked Data," coined by Tim Berners-Lee, is the subject of a 2006 Design Issue note. There, he describes Linked Data as a principled approach to structured data representation, access, and integration for the World Wide Web, based on the use of HTTP URIs (Hyperlinks) to denote entities such that when these URIs are resolved (i.e., looked up, or "dereferenced"), they return RDF-model-based structured content (data) that describes the denoted entity. Linked Data enables direct and easy integration of entity-relationship-model-based structured data into the Web, which enables users to construct powerful structured "data meshups" across the disparate data sources found on HTTP networks (e.g., the World Wide Web), without any programming. This forms a marked contrast to the unstructured "data mashups" commonly seen today, which typically require programming at several points in their production. Linked Data URIs facilitate untethered data access that transcends database vendor, database engine, operating system, programming language, application server, application development framework, and other infrastructural confines, unlike ODBC, JDBC, and other data access mechanisms. 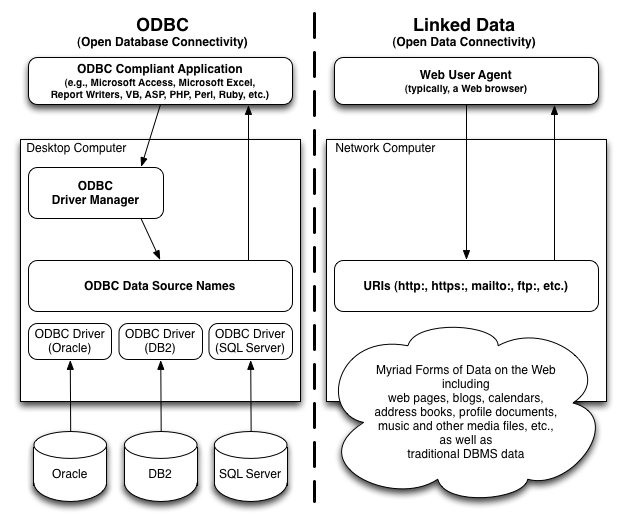 The illustration below highlights Linked Data's parallels with ODBC in relation to DSN based data access. An evolution of the Web that places you a click away from a structured description of any Web accessible resource. A more granular Web where interaction focus moves away from opaque compound documents to the entities they host. As illustrated below, it's the moniker for the growing collection of Linked Data sources being injected into the Web by the Linking Open Data Community. As Kingsley Idehen stated in his blog post, "Semantic Web: Travails to Harmony Illustrated", harmonious intersections of instance data, data dictionaries (schemas, ontologies, rules etc.) provide a powerful substrate (smart data) for the development and deployment of "People" and/or "Machine" oriented solutions. The clickable venn diagram below provides a simple exploration path that exposes the linkage that already exists, across the different Linked Data types, within the burgeoning Linked Data Web. There are several paths to materialized Linked Data. By providing bridges between areas of interest and knowledge, the Linked Data Web can reveal relationships where information might otherwise be seen as unrelated. For instance, one might explore which industry and government leaders had previously been classmates or were somehow connected by family. The OpenLink Data Explorer enables a user to browse from one "thing" to another just as easily as they would click from one page to another with standard hyperlinked document browsing, but with greater understanding and comprehension from the first click. The best way to learn how this extension can help you is to install it, and follow along with the examples below. If you decide you can't benefit by exploiting the Linked Data Web in this way, you can un-install the extension without harm. 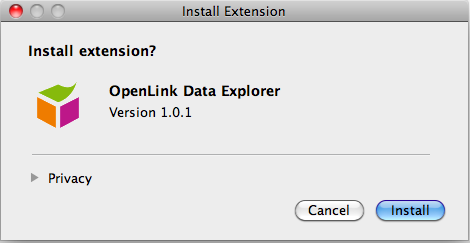 The loading of the OpenLink Data Explorer tool differs slightly depending on which method was used to download it. From the Mozilla Add-ons site, click on "Add to Firefox", Firefox will then install the Extension as an "Add-on". From the OpenLink Web Site, download the "ode.xpi" file and load from the "Open File" menu item of the Firefox "File" menu. From the Amazon S3 Storage Site, you will immediately be presented with the option to install the ODE add-on. From the Softpedia Web Site, download the "ode.xpi" file and load from the "Open File" menu item of the Firefox "File" menu. 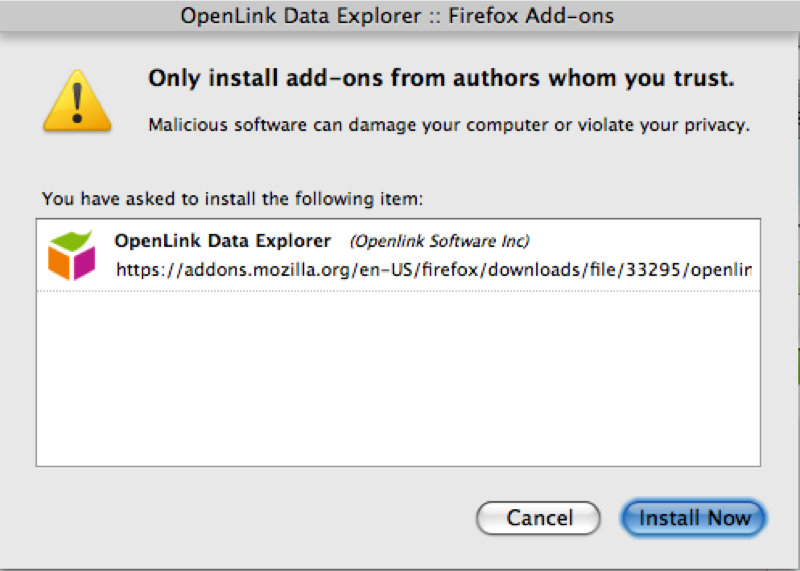 The OpenLink Data Explorer Firefox Add-ons installation dialog will then be presented. You will need to restart Firefox after it has finished installing. Once it has finished restarting, you should see the extension in your add-ons list. From the Amazon S3 Storage Site, the ODE extension will be downloaded, double click on the "Safari_ODE.safariextz" file to start the installer. Click the "install" button to commence the installation. Once complete check the extension tab of the Safari preferences to see the installed extension. From the Amazon S3 Storage Site, the ODE extension will automatically be downloaded, click on the "continue" button to start the installer. Once complete check the "Extensions" menu item of the Windows menu to see the installed extension. After downloading the ODE Extension from the Amazon S3 Storage Site, click on the "install" button to start the installer. The ODE "installation complete" dialog bubble will be displayed when done. You can check the "Manage Extensions" menu item of the "Extensions" menu to confirm the extension has been installed. After downloading the Windows installer from the Amazon S3 Storage Site, double-click it to start the installation. You can use the Internet Explorer "Tools" -> "Manage Add-ons" menu item to confirm the extension has been installed. In Firefox, select the Tools -> Add-ons menu item. 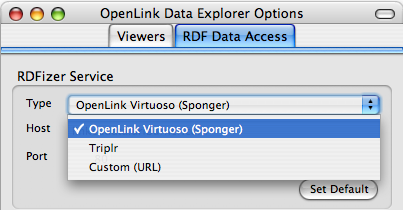 Then select OpenLink Data Explorer and click on the Preferences button. In Safari, click on the new cubical-box icon in the toolbar to the left of the browser URL address window. 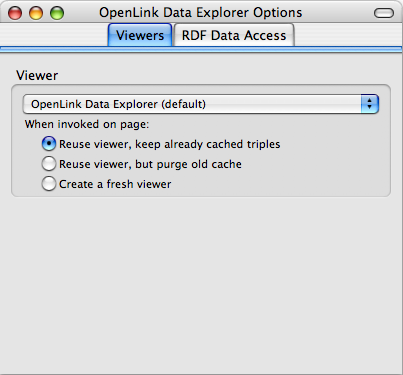 In Google Chrome, select the Windows -> Extensions menu item, and select the options link of the OpenLink Data Explorer. In Opera, select the Tools -> Extensions -> Manage Extensions menu item, and select the Preferences link from the drop down list to the right of the OpenLink Data Explorer icon. In Internet Explorer, go to the Command toolbar, and click the ODE extension icon to load the preferences dialog. The default "Viewer" option has the benefit of being built into the Browser Extension, and therefore provides the smoothest browsing experience. It is possible to modify the RDF Browser (Viewer) and SPARQL Endpoint to use any available server which has the right capabilities. 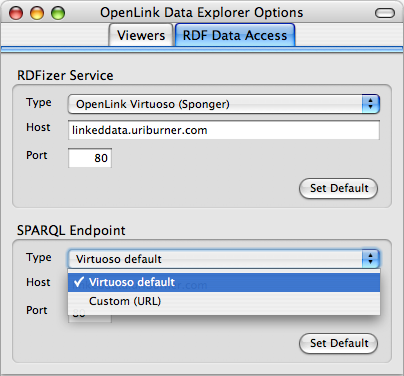 The image below shows the default configuration which uses the OpenLink Data Explorer viewer hosted on the OpenLink linkeddata.uriburner.com server. "Custom (URL)" allows the entry of the URL for a known third party viewer that can be used. "Custom URL" of the form "http://server:port/proxy?url="
The steps to use the OpenLink Data Explorer are simple. Under the View Menu in Firefox only, click "Page Data Sources". Right-Click (or Ctrl-Click on Mac) the page or a link, then click "View Data Sources". An OpenLink Data Explorer interface will load in a new tab and you will be able to seamlessly browse through the Linked Data Web. Under the View Menu in Firefox only, click "Page Description" link. Right-Click (or Ctrl-Click on Mac) the page or a link, then click "View Page Description". Note that these bookmarklets will load in the same tab. The examples page walks through some of the options and functionalities of the OpenLink Data Explorer.